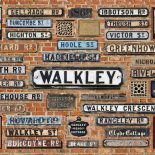 Walkley History | News, events and discoveries of the Walkley Ways, Walkley Wars history project. Walkley Historians are holding a Victorian Fair on Saturday 22nd June as part of the Walkley Festival. Walkley Historians will be at the Sheffield Heritage Fair on the 19th and 20th January, at the Millennium Gallery. Of four Walkley brothers who served during the First World War, only one returned home. Here are their stories as discovered by Anthony Cutt. We have been asked to tell people about this event in the new year. Wander into Walkley and Sheffield’s Victorian past with a series of talks that bring history to life. Would you like to lead guided walks? Would you like a train as a guided walk leader? The Street Heritage Research Group is a newly formed group, consisting of a loose network of academics, local historians, activists, campaigners, artists and performers. The first Hand-Pulled History event was a big success at The Florist on Tuesday night. Take a pint-sized tour of Victorian tales from old Walkley pubs – local history in the comforts of your local! March’s talk is by Hugh Waterhouse about ‘The Baron of Walkley’. 7pm, Friday 11th March 2016, Walkley Community Centre. Entry is free and there will be a small cafe. You can watch the videos made during the Walkley Ways, Walkley Wars project. Walkley Community Centre’s three-year history project, Walkley Ways, Walkley Wars, came to an exciting finale with a book launch and film premiere at the centre on Friday 11th December. Here is a small selection of excerpts from Walkley Ways, Walkley Wars interviews which recall the night of the Sheffield Blitz, 12th December 1940.